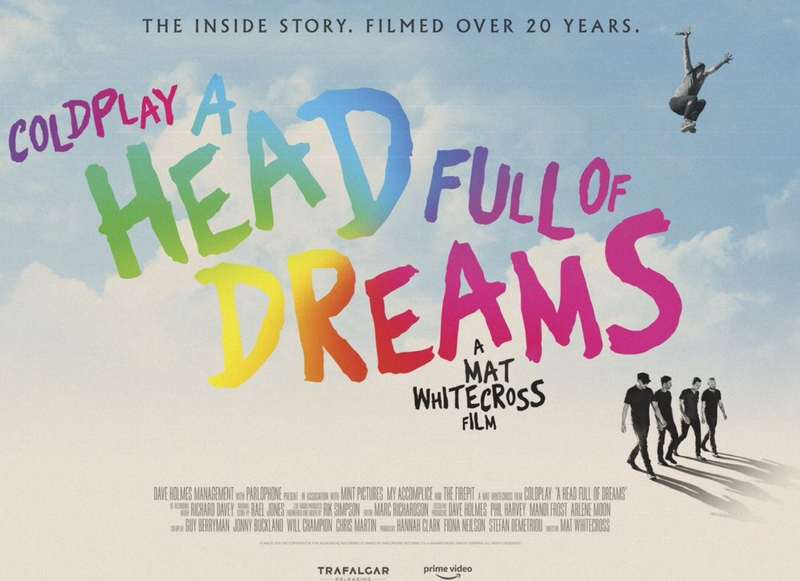 Hot on the heels of 2016’s excellent Supersonic documentary which covered the early years of Britpop legends Oasis, Mat Whitecross delivers A Head Full of Dreams on his former college friends Coldplay. The film is framed around their last album of the same name and how it has become the culmination of everything Coldplay were striving towards since 1999……or at least that is what Chris Martin believes. The film leans heavy on the early years pre 2005’s X&Y with some fantastic and very intimate footage of Chris Martin, Jonny Buckland, Guy Berrymore, Will Champion and the behind the scenes fifth band member Phil Harvey who comes out of the rock doc as the understated hero of the group who keeps it all together. Seeing the band in their late teenage years, in their dorms messing about on guitars and making bold proclamations is worth the price of admission alone. You just really never get to see material this innocent, candid and raw on most bands. When do you get to see rockstar baby faces full of braces, pimples and bad hair? Now it certainly helps that they had a film junkie classmate in Mat Whitecross who always was carrying a camera around campus recording what he sees. It also helps immensely that he went on to become a successful documentarian and Coldplay to global super star success. A perfect marriage for a project like this. As a fan of their earlier material, Parachutes to the end of the A Rush of Blood To The Head campaign, I found everything I saw fascinating and nostalgic for the first hour or so. The highlight of this film for me was seeing Chris in studio hitting the opening bars for “The Scientist”. It was obviously one of the earliest moments of him playing that song. Long before it would be adored by millions. A moment like that literally made the hairs on the back of my neck stand up. Another moving piece of the doc was seeing Chris in 1998 boasting into the camera about where the band is heading and will accomplish in the next 3-4 years and then seeing that juxtaposed with their headlining slot at Glastonbury in 2002. An epic moment. I truly loved the band’s initial image and musical direction of Bends era Radiohead meets Jeff Buckley. It was sad to see them leave that path following the blowback of X&Y despite the sonic pop flourishes of Viva La Vida or Death And All His Friends in 2008. The biggest turning point in the band’s career thus far was Phil Harvey leaving the band temporarily during X&Y (he would later return in 2007) and the negative vibes surrounding that album/tour despite robust sales. Chris Martin and company basically decided they wanted to be liked and be liked by a vast majority of potential listeners across the world which translated to more pop infused songs (“Viva La Vida”, “Paradise”, “A Sky Full of Stars”) and mega star collaborations (Jay-Z, Beyoncé and Rihanna). There is no shame in that and whatever fans they lost in that transition they picked up legions more as they elevated themselves to U2 global status. Coldplay is no longer a band, they’ve become a brand. The film oddly enough sprints through the albums Viva La Vida, Mylo Xyloto and Ghost Stories during its second hour. The pace was too fast for albums that connected to wide audiences, generated massive hit singles and really could have benefitted from using more time to explore those phases of the band’s career. However, nobody wants a 3 to 4 hour film so tough choices needed to be made. This reminded me how for Oasis’ Supersonic documentary, Mat Whitecross wisely focused only on their debut Definitely Maybe and mega hit follow up (What’s The Story?) Morning Glory and now legendary gigs at Knebworth in August 1996. The framing of that film worked brilliantly for Oasis as it really got to the essence of what that band was all about. It was a roller coaster ride over a three year period. Coldplay on the other hand are a band still in progress which begs the question of why is this film being released now with what seems like a lot of meat still left on the Coldplay bone? I think a documentary of this subject matter would be better served years down the line when Coldplay is no more. The footage will always be there. The stories can only get more rich with the passage of time. Coldplay’s dream is still being lived.